I was talking to someone recently about our property in Florida, and was saying how the expenses were higher than we first imagined, and in turn our return is a bit less than what we were hoping for. Initially I was hoping for a net yield of around 8.00%, I thought this might be a bit optimistic but going through the numbers before purchasing a property, it seemed like a realistic value. But after obtaining our property in Florida and seeing first hand the expenses, it seems that despite being fairly conservative in our initial assumptions, the return is still less than what we initially hoped for. However, if you rearrange the numbers a little, the investment looks better and perhaps even a bit more realistic as well. See below for the initial and subsequent calculations which show net yield returns. The Net Yield of 0.56% is less than desirable, and if we were told we would be getting this return then I don't know if we would have taken the leap to invest in the US as the hassle would just not be worth it. Although I did not include any capital gains on the property (as our plan is for cash flow) this can be disregarded as the cash flow target simply has not been met. 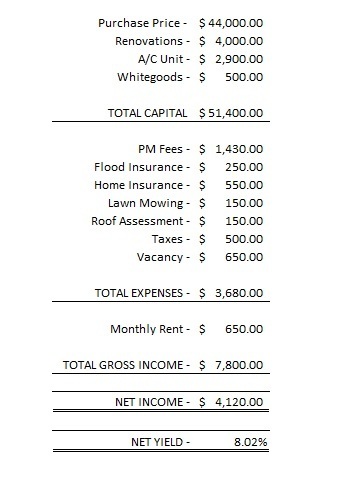 But by making some adjustments to the calculations, like shifting some of the expenses to the capital (moving the cost of the A/C unit and the whitegoods under capital expenditure), the numbers start to look much better. 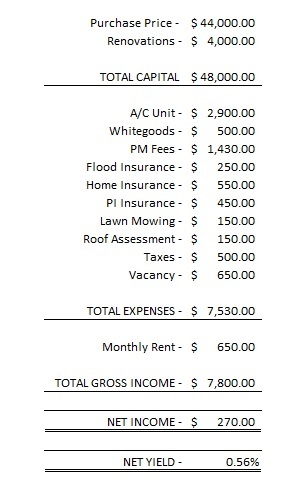 This is realistic as these expenses are not a yearly expense and you would hope that a new A/C unit would last a few years at least, the same with the white goods. Further, you can remove the cost of PI insurance (as this expense is not dedicated to this single property and will cover all properties under the LLC) and include it as part of the LLC's general overheads. calculating that gives you a very different result. I think this is a good sign to be careful when seeing advertisements purporting unbelievable returns. You should always look through the numbers yourself and satisfy yourself that what is being advertised is achievable. You should also always check whether the returns are 'gross' or 'net' yield and what expenses have been considered. Having a quick look on www.realestate.com.au you will see there are several properties that can provide you with neutral/positive gearing. Have a look below at a list of properties with their figures and gross yields for each of them. These are all simple calculations and using a spreadsheet was able to take only a minute to generate them. Note these are all free standing houses so have no strata associated with them. The interest is assumed to be 5.50% per annum. As you can see, just having a quick look there are plenty of properties which can offer you positive returns. Now I understand that I have only done gross yield, and there are plenty of expenses that have to be accounted for that will severly reduce the overall yield, but hopefully even without some of these expenses the properties should be at least neutrally yielding. It is also important to note that it is not always the best to go purely off yield as a figure, but sometimes a figure like weekly profit would also be a good test. In the above table, a higher yield does not always correspond to a higher weekly profit. And at the end of the day that is what is really important, getting that money in your pocket! A cash on cash return is also a good way to check and compare properties, the following table does a cash on cash return with a couple extra assumptions. Assumes a deposit of 20%, additional purchasing costs of 5% (stamp duty, lawyer fees etc). 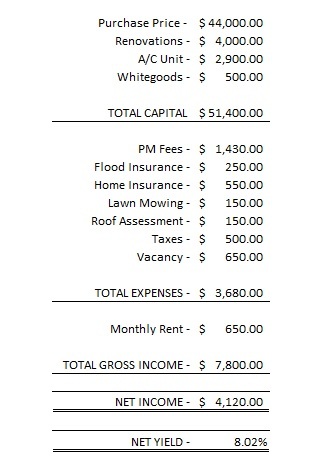 And additional expenses such as property manager fees, insurances, rates etc of 2% of property value. As you can see, when you do a bit analysis into the figures a lot of the properties start to give you poor returns, and are slightly negatively geared. Keep in mind that even the worst performing property above is only in negative about $1,700 per year, about $33 per week. But still, it is costing you money, not making you money! On the other end of the scale, there is a property that is earning you $4,140 per year, an extra $80 per week! It may not sound like a lot of money, but it is all passive income, money in your pocket for doing minimal work. As I said at the start, finding positively geared properties is very difficult, the list of properties above, although looking at the gross figures appeared to give you positive returns all of them, with a bit of analysis, it showed that most of them were indeed negative, albeit not too badly. But the point to remember is that the positively geared properties are still out there! I searched for about 30 minutes to find this list of properties above, and only searched in one city. The analysis took a further 30 minutes, so one hour of my time and I can find a good positively geared property to help increase my real estate portfolio. Disclaimer: By viewing this website, you acknowledge that it is for informational purposes only and does not imply any contractual agreement, promises of returns or legal expertise. All investors should consult with legal representation and appropriate accountants before making any investment and should ensure that individual due diligence is done. Any information provided here is for educational purposes only and should not be taken as financial advice. With a new year under way, now is the best time to organise your financials and plan for a prosperous year ahead. These four tips will assist you in making 2013 your strongest investing year yet. You’ve probably heard this one a bunch of times, each time brushing it off as unnecessary or something to look at later. It took me quite a few years of doing just that before I finally realised the benefits of setting goals at the start of each year. Setting goals will help you focus your energy and give you some direction throughout the year. It doesn’t need to be an onerous exercise but each goal does need to be actionable and measurable. For example, ‘purchase another investment property’ or ‘increase passive income to $500/week’ provide clear benchmarks to aim for. ‘Get rich’, on the other hand, won’t really do. is, most importantly, something that you’re passionate about achieving. The goals that you set at the start of the year can be amended and updated as things change. An end-of-year review is something everyone should do, regardless if you set any specific goals the previous year or not. When you treat your investments as a ‘business’, your overall results will improve. Undertaking a review doesn’t need to be too complicated. Start off by asking yourself simple questions such as, ‘Am I happy with what I achieved this year?’ and ‘What area could I have improved in?’. Next, list your achievements for the year (this doesn’t need to be limited to your financials) and areas where you lost a bit of focus (for example, sticking to a budget). The final step is to review all of your current investments to see how they are travelling. Budgeting ties in nicely with the first two tips. Once you’ve set your yearly goals and undertaken a review of the previous year, you’ll be in a much better position to move forward with all of your financial pursuits. Find a basic budgeting spreadsheet on the internet and fill it in as accurately as possible. If you’re unsure about any numbers, make an educated guess, but do try to be as comprehensive as possible. With your budget complete, you will be able to see exactly where your money is going on a weekly or monthly basis. This will also assist you when you undertake your next end-of-year review. Deposit a portion of any excess income into a high-yielding online savings account where it can stay until the next deal comes along. Start each year with a relatively clean slate when it comes to records. It’s easy to be overrun with too many emails, RSS feeds and ‘to-do’ lists. Give your inbox a thorough clean-out and try to keep it clear by archiving old emails. Keep one ‘to-do’ list (preferably one that you can access everywhere, for example, with Evernote), then write down each day’s actions on a Post-It note. Lastly, file everything (electronically and hard-copy) that is important using a clear folder structure. Interest rates: are your investment decisions sending you to an early grave? On the first Tuesday of every month something happens that gets every property investor and commentator curious. I am talking about the meeting that the Reserve Bank of Australia (RBA) has every month to talk about all things interest rates. It may seem insignificant to change interest rates by 0.25%, but 0.25% means millions of dollars for banks and financial institutions. If property owners are treading that fine line of only just being able to service their loans, then one rate change in the wrong direction could leave them struggling to make ends meet, and a couple rate changes could leave them close to having to sell their home or even facing bankruptcy. This is why it is so important that people take into consideration the potential consequences of rate changes before they sign up to a new loan. A property loan is a long-term deal. Even with refinancing you could still be locked in for up to three years - and facing 30 potential rate changes in that period. It's a matter of needing to hope for the best but plan for the worst. I still remember when I got my first home loan ... the standard variable rate at the time was about 5.80% per annum and with that rate I was comfortable making the repayments, even being able to manage some extra repayments. But before I finally signed off on the contract, I wanted to make sure that changes to the interest rate wouldn’t leave me bankrupt. Having done the sums, I would have still been able to make the repayments if the interest rate rose to 10.00% per annum. A simple way to check is to add 3.00% to the current standard rate and see if you are still able to make repayments. If you can then you should have no problems servicing the loan. It’s interesting to note that most financial institutions don’t advise you to carry out this sort of simple, yet very important, check. I was given pre-approval for a loan amount way out of my limit. Add to that a few rate changes in the wrong direction and I would have been on the brink of not being able to service the loan. In my opinion, this is just pure greed on the part of financial institutions and is plain negligent. A lot of people will take the pre-approval amount and start looking for properties up to this price range, completely unaware of the precarious position they are putting themselves in. Add to this the tendency for Australians (at least in the past) to live way above their means and you have a perfect recipe for disaster. At the end of the day, however, people still need to take accountability for their own actions and should take a greater interest in their finances. Getting finance is the most powerful tool property investors have in regards to building wealth, but, like most things, it is a double-edged sword. You need to take stock of your current situation and plan for the different circumstances that could arise in the future. I have watched my parents worry about bills as they come in and get stressed at the increases to grocery prices. One of the things that they did do right was to pay off their home loan as fast as they could. Couple that with a large deposit and they didn’t need to wait for RBA’s monthly interest rate announcement with sweaty palms. It is this mentality that I have emulated. When I see the interest rates change, I know my large buffer will keep me going before things get tight. As I increase my investment property portfolio, I make sure that I use these ideals in every investment decision. The last thing that I want is to be watching the news once a month, praying that the RBA does not increase interest rates, knowing that if they do, it would lead to financial catastrophe. Investing is about growing wealth, not about growing stress. Does US Tax Make Sense? Realising that we are going to have to start filing a US tax return at the end of the year (the US financial year runs from January to December), I started to look into how the tax system works and what forms we need to fill. I have not figured out all the complexities of their system but I believe we are going to change the classification on our LLC so that it is classed as a corporationn(C Corp) for tax purposes. I remember seeing C Corp and S Corp when we were first setting up the LLC, but did not know the repercussions of each class, so we ended up going for the default partnership arrangement. Unfortunately, if we leave it as this, it means that both us will need to apply for an ITIN and file individual tax returns. Essentially each tax return will declare 50% of the income and deductions and you also have to file a tax return for the LLC. It is amazing isn't it, Person B earns more income, yet because of how the US tax system is setup, it forces him to be taxed more and end up with a lower net income! It really does not make sense. I am tempted to ask my US accountant if this is true. It would make me want to ask my boss for a "de-raise" if I was close to one of the brackets or look at what tax deductions I could claim to lower my taxable income. What do you think? Streamline Investing Corporation. Powered by Blogger.